Smooth feeding ammo great for plinking or punching paper at the range. Packaged in 10-round stripper clips, with 9 stripper clips per box for convenient storage and transport. Designed specifically for use in rifles with a free-floating firing pin. It's ammo with consistent and dependable performance you can rely on, shot after shot. Look for the discolored case. Annealed per military requirement. 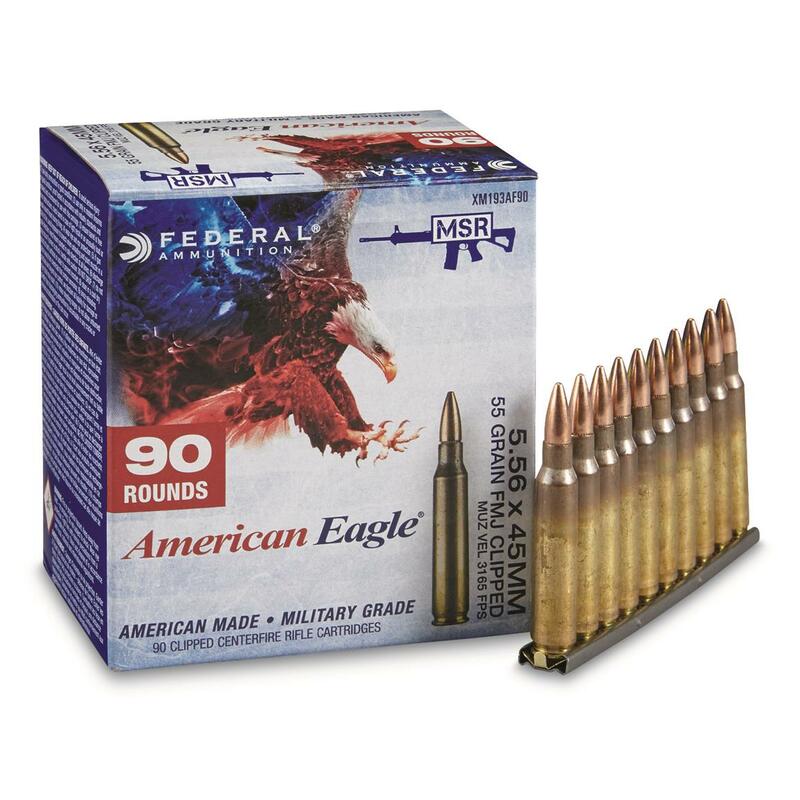 This ammo has been annealed, so you know it meets true military specs. Unlike your standard civilian round, the military requires visual proof of the annealing on the case, causing the case to appear discolored. This is done intentionally to meet military requirements for overall durability and strength in the completed round. PLEASE NOTE: While the 5.56x45mm round will fit in a .223 Remington chamber, 5.56 is a military round that is loaded to higher pressure than its .223 counterpart, and is therefore not recommended for use in rifles chambered for .223. Hit the range and order today! American Eagle, .223 (5.56x45mm), FMJBT, 55 Grain, 90 Rounds with Stripper Clips is rated 4.6 out of 5 by 22. Rated 5 out of 5 by Gun Trash from Good ammo & with stripper clips! Good ammo. No problems at all. Fired every time i pulled the trigger & ejected like it should. Comes on stripper clips so if you're going to use those you need to have the spoon that fits over the magazine. Not a major problem as most of the on line gun dealers have them. Just do a search on "AR magazine spoons" & you'll get lots of results. Rated 1 out of 5 by sharky from No sealant. I bought 2500rds of Federal Lake City xm193 5.56 ammo a month ago and Im sorry I did. None of it is sealed. In addition, gone is the NATO spec. In its place is 'MSR' whatever that is. Look at the new packaging and see for yourself. I should have gone with one of the foreign brands that are of higher quality. Rated 1 out of 5 by sm1718 from Drop in Quality - Do Not Buy!!! Recent production lots have a confirmed drop in velocity (almost 100 FPS) from spec and accuracy. I would NOT recommend. Rated 5 out of 5 by Bakerc7 from Good ammo Shot in my DPMS. No problems at all. Was at a 25yd range. I was getting groups that could covered by a quarter, didn't have tape measure. I had a 4 moa dot, so not real precise. The strippers worked fine with a mag adapter. They were fantastic with a stripula! Rated 5 out of 5 by Retired9 from Great amo Used this many times before. Good for practice. Pull trigger, goes bang! Rated 5 out of 5 by Karbine from Very good deal. The convenience of rounds on strippers is great. I have lots of strippers and I try to keep them loaded and my bandoleers ready for a trip to the range (my south woods). I'm not preparing for WWIII, but when shooting it's nice to speed load the mags from strippers. Sometimes I get too busy to keep my strippers loaded and it's nice to have a few hundred rounds ready to go. Powerful hunting ammo for terminal results.